Eurotec container used in the robotic and conveyor industry - view the full range online | George Utz Ltd. This EUROTEC system containers is designed on the basis of its many starting points ideal for the application by robots and conveyors. Various interfaces facilitate a grab of gripper arms. 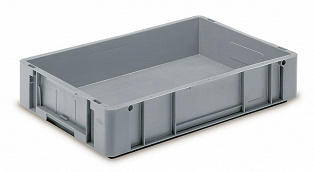 The plastic container comes in a grey colour with dimensions 600 x 400 x 120 mm has closed side walls and a closed bottom.